I’ve been streaming since January of 2012. It started as a hobby and I honestly never expected anyone to watch me play games. But, it was a fun way to reach out from my small corner of the world and somehow connect, while also showing that gamers are just that… gamers, regardless of gender. Every time someone tuned in and followed me, I was thankful. Eventually, in 2013, streaming became my full time job. I asked my fans to help me create a way to display followers and tips, and for the next couple of years I used a customized program to do just that. 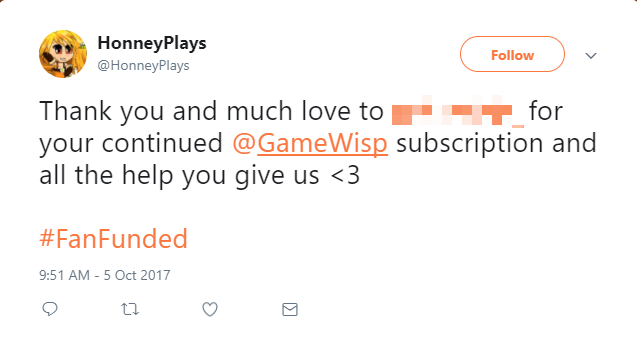 With the encouragement of my fanbase, I started looking into various options such as GameWisp and Patreon for additional support, and in early 2015 I started up my own successful GameWisp campaign. These subscriptions, and the space around them, have become a central part of my stream and my community, and, since the very beginning, social media has been one of my most powerful tools in keeping my campaign, and my community, as healthy and positive as possibile. One of the hardest parts of establishing the tiers and rewards for a subscription platform is always going to be how to choose the rewards and what monetary levels are best for those tiers. When it came time for me to choose, I knew I had to work in some way to publicly thank folks for their subscription. Not just once, like a follow, but each and every time they resubscribed. That recognition is important; it makes it clear just how much you appreciate the contribution, using your time and platform to reach out directly to them, and for many subscribers, thes shout-outs are rewards in and of themselves. The hard part was figuring out how best to deliver these social rewards. I chose Twitter to reward my #HonneyWisp subs over other platforms because it’s quick and easy, with no friend requirements and a built-in character limitation, so I can’t get hung up on some imaginary number of words that works. Most people have Twitter and those who don’t can simply reject the benefit. It’s what worked best for me, but a different platform might be best for you and your audience. From a social media standpoint, where do your fans hang out? What kind of social media content are you inclined to make yourself? If you’re not one to tweet, maybe you’re more into photography, and a platform like Instagram is more your speed. Everyone is different. What’s important is figuring out what works and sticking with it. Whatever you specialize in, we are ALL entertainers, and for our fan base to reach out, subscribe and support is a blessing. I know I’m grateful for my subscribers and the natural expression of that gratitude is to acknowledge it with a simple thank you. Sharing that thanks over social media has the added bonus of promoting your subscription option to people who might not have otherwise known. Perhaps they are new to your work, and they see one of their friends retweet your thank you. Maybe they are long time fans, and when they see the reward it triggers the thought ‘Oh yeah, I can do that too’ or ‘Man I meant to subscribe a long time ago,’ etc. I try to use this reward option as a way to connect further to my audience as well. Let’s face it, sometimes there is nothing to say, or no time to say it, but, if I know someone was having a rough day or has an illness in the family, I can mention that and check how they are doing at the same time. Have fun with it guys! Use your own hashtags like #FanFunded and even throw in links to your subscription or donation campaign so folks can go check you out themselves. Retweets and shared links are a potential source of new fans and subscribers as well. We each need to find ways to balance the rewards to our subscribers and the time and effort it takes to fulfil them. In my personal experience using social media as a benefit is a simple and effective way of connecting and communicating with my fans. Be sure to check out Honney's stream by clicking here, and follow her on Twitter to see how she works first hand!